Today, I’m going to tell you a little bit about my friend, Emily Henderson. 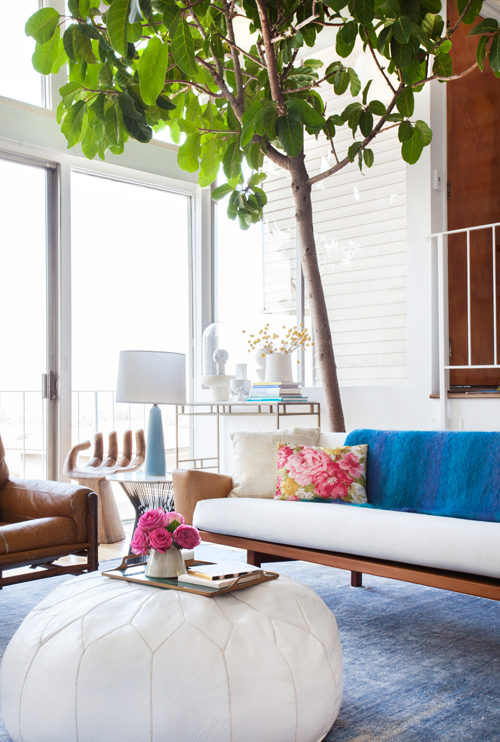 Do you follow her interior design blog? Emily is a pure delight — she’s funny and super stylish, and she doesn’t take herself too seriously. And Emily happens to be having a pretty spectacular month. 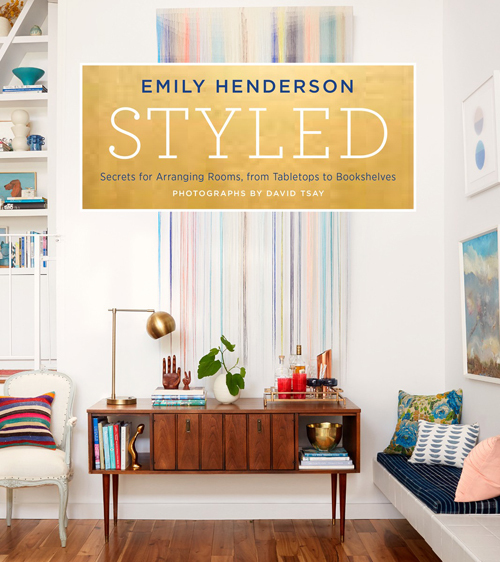 Her gorgeous book, Styled, came out last week. Which is a big deal, of course. But an even bigger deal? Her gorgeous daughter was born 2 days ago! Happily for us, before Emily went on maternity leave, she sent over her top 5 tips on making a home kid (and family) friendly, with lots of stunning photography to illustrate. 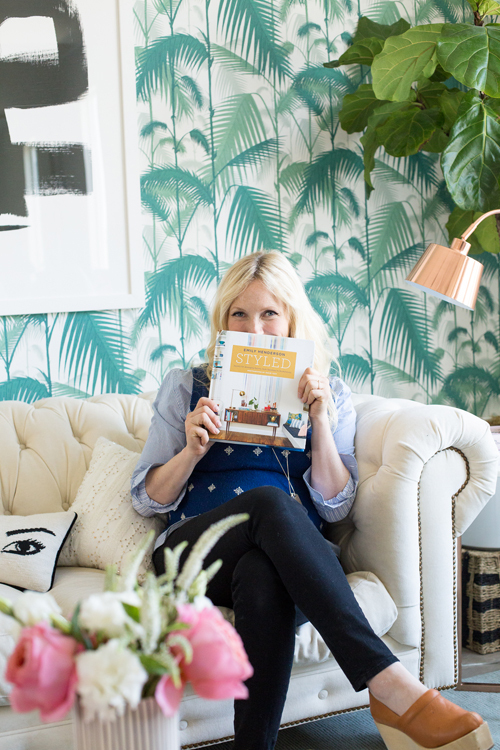 I know you’ll love what she has to say, and I highly recommend picking up a copy of Styled. It’s completely packed with helpful, useable advice. Say you’ve picked out your furniture, placed everything just so, but somehow your room still feels unfinished? Styled to the rescue! Emily will teach you how to approach the details of each room so that your house feels polished, thoughtful and totally livable. 1. Choose furniture that does double duty. 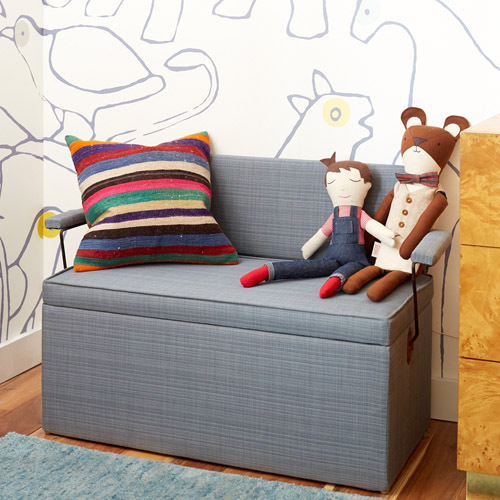 Think storage trunks, side tables with drawers, or dressers as changing tables. Once you have a baby you organically have more “stuff”, it is just the way it goes. From toys, to diapers, to baby clothes, to everything else you will quickly realize that your home looks like it houses 200 babies rather than just your own little bundle of joy. Help combat that overflow of new items, but finding furniture that does double duty and helps to hide away the unwanted clutter when it is not in use. Anything that is functional in more than one way is a winner for me. 2. Look for heavy, chunky, and not too leggy furniture. Once babies and kids realize that they have enough strength to push over or destroy anything it will be their sole mission to do that to everything in your house. Try and find pieces that are well grounded or heavy. Opt for chunky coffee tables rather than leggy or tulip based pieces which will prevent them from accidentally/or intentionally knocking a piece over. 3. Use stain repellent fabric. Children are messy. Period the end. No matter how careful you may be, it is just inevitable that your cute little toddler is gonna rub his grubby little fingers all over your velvet sofa, or choose to wipe his face with your linen curtains. There are plenty of fabrics that will help to prevent you from wanting to rip your hair out after an accident like this happens. Sunbrella has expanded its inventory to include hundreds of beautiful options that are completely stain repellent and cleanable. In addition to those, leather, ultrasuede, and performance velvet are all great and very forgiving options. 4. Opt for safe accessories. Accessories with children are tough. They love to grab (and break) any shiny or small object in sight. So rather than have your precious mementos strew about, stick to safe accessories which include, books, pillows, and blankets. 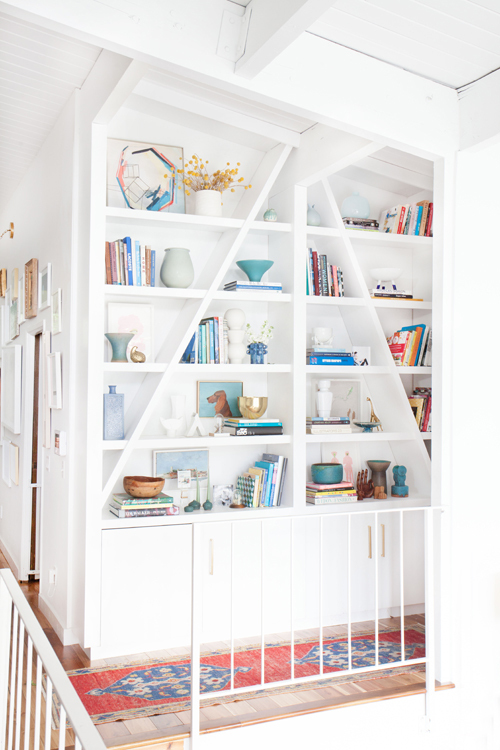 Move your fragile accessories from your coffee table to higher shelves, and keep your lower shelves filled with baskets, books, or empty until your children learn their manners and proper vintage etiquette skills like their mother. 5. Fall in love with forgiving rugs. Spilled milk is nothing to cry about unless it spills all over your living room rug, in which case you might want to eradicate all but clear liquids from your fridge. Keep your rugs and your babies happy by using easy to clean and forgiving rugs. Stay away from viscose and silks and opt for quilted hides (I have one in my living room), Persian rugs because of their dark and busy patterns and natural fiber rugs as they are all very easy to clean and or hide a spot in. Thank you, Emily, for the helpful tips! I love that quilted hide rug. It’s genius, and I think it would be perfect in my living room. Congratulations on your excellent book, and congratulations on your growing family! I disagree with nearly everything here. Kids are not monsters. If you keep food in the rooms where food is meant to be (kitchen, dining) and outlaw eating in the living room then there will be no greasy fingers on the sofa. It’s that easy. And if you begin this rule at birth then the kid just knows it and does it and it’s not a toddler battle. As for breakable items on low shelves, leave them be. Remove anything tat could actually hurt a curious kid, of course, but leave things that are not for the kid put, and add a basket that is for the kid to touch or play with. Tell them, yes to that and no to the rest. Otherwise how will they learn that some things are for them and others or not. Making everything within their reach for them makes them nightmare children when out in the world where that is simply not true. Sheeseh, people have lived with kids for long before we decided we had to redecorate for them. I disagree strongly with you- it is a wonderful way to approach the toddler years. The article never stated to remove everything, redecorate or not teach your kids the proper places to eat. Please take a look at the pictures: there is plenty that a chikd should learn not to touch or break. Those books don’t look like board books for children to me, however all of these items leave space for teaching a child to leave it alone or not rip it without having to loose your most precious or valuable piece before you have time to “teach” the baby, which we all know is half a second. I would have completely agreed with you, Holly…that is, until I had a kid. Turns out there are different kind of people in the world, and they are different when they are kids as well. Mine happens to be a wild man and has since he was 3 days old (no joke!). I can tell him “no” a hundred times a day, and he will still grab things that are off-limits, still climb to the top of the bookcase, still find ways around standard baby proofing. We take a minimal approach to baby proofing and removing/modifying our decor, but sometimes I wonder if we should do even more of what Emily is suggesting. Holly-I totally understand your approach. However, I have to agree wholeheartedly with Rachel. I have four children. Two of them are gentler with breakables while the other two have lovingly been nicknamed “destroyers.” My five-year-old is still not capable of keeping food at the table or not breaking ceramics the first time she touches them. We have opted to remove and/or protect all fragile things mostly for our sanity and their safety. I want to spend my time enjoying my children, not constantly correcting them. If you happen to have children that are easily trainable in these areas, by all means, enjoy decorating around them. But, please don’t judge those of us whose children are not. I kind of agree with you. I started to remove things that were breakable but then I realized that doesn’t work at everyone’s house! I can’t ask every house we go to to remove all their glass vases from 3ft and under. Its not realistic. I have a boy who is 2 and girl who is 5 and from almost the very beginning we have been teaching them about respecting things that aren’t ours. If I don’t teach them at my house what the heck am I gonna do at Grandma’s? Monitor their every move and run around removing figurines from their hands? No thanks. However, my kids only eat in the kitchen and for some reason I’m still washing the lower half of the walls every week because of grimy fingerprints. I agree – if you turn your house into a padded cell, what happens when you go to anybody else’s house? My nephews are being raised that way, and as a result, whenever they visit us, I get guilt-tripped by my brother-in-law and sister-in-law for our house not being “child-friendly” enough. (Ironically, we have a son the exact same age.) It’s not like I’d be upset if they broke a dish or a lamp, and I find it insulting that the parents assume I would. Also, it’s not restful or conducive to any actual adult socializing that the parents are following the kids around 24/7, just as you describe. I am so excited to see this post -I love, love, love Emily Henderson and have following her blog for years! Her style is so beautiful, but completely livable, and just makes me want to redecorate every room in my house. Or better yet, have Emily do it for me. This house does not look kid friendly. I’m looking at the pictures…she says keep things on shelves that you don’t mind kids grabbing, she must not mind 1.5 year olds pulling all those books off the lower shelves daily. My children are well behaved but this house looks like a museum with nothing for them to touch but everything within their reach. I agree with these tips! Another good one is to buy cheap things that you won’t be too upset about if all of a sudden they’re gone and broken, and not in your life anymore! I enjoyed the post and I’m fascinated by the comments. Somehow this feels like it turned into a discussion about raising children “the right way.” I understand a lot of us feel passionate about parenting and want to raise children in a way that reflects certain values, but somehow we end up criticizing others and becoming defensive in the process. I reread Emily’s article a second time–this time without looking at the pictures. I just focused on her suggestions: 1. Choose furniture that does double duty. Think storage trunks, side tables with drawers, or dressers as changing tables; 2. Look for heavy, chunky, and not too leggy furniture; 3. Use stain repellent fabric; 4. Opt for safe accessories; 5. Fall in love with forgiving rugs. I can’t find fault in any of these suggestions. You may or may not agree with her about the details, but her main points are solid. Mothers out there, let’s support each other, even when we disagree on the details. Sarah, I feel the same way. I must admit, this did remind me that I may have taken my babyproofing too far (although I am a mom of twins, and the world changes when you’re telling two toddlers no, and they’re laughing at each other and you when you say no.) Thing I removed: fireplace tools (so dangerous), fragile heirlooms from my Grandmother, and these really heavy stone coasters that could seriously damage my coffee table if pounded. We don’t have cabinet locks, toilet locks, etc. 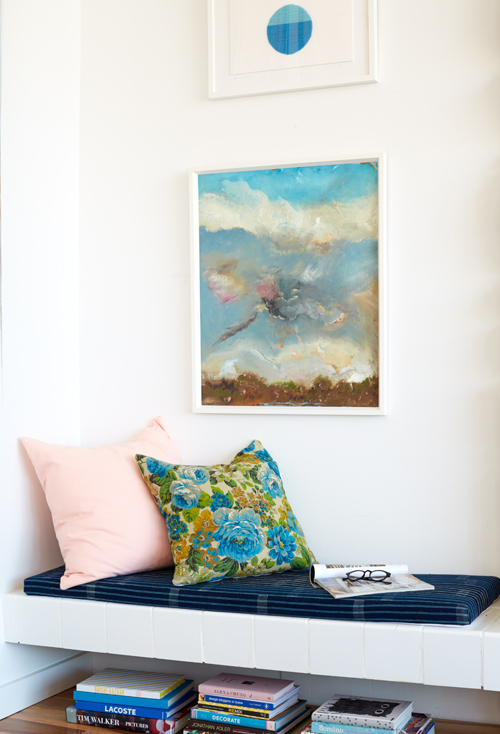 I love the idea of buying cheap items to style your home (e.g. buying a coffee table book from Goodwill or an objet from Target.) What would be helpful is a resource or guide on how to teach children to be gentle instead of ripping your nice coffee table book to shreds. How did you do it? I’m so anxious to know. Some parts of motherhood don’t come as naturally or as easily to me. Also, aren’t there just times in our lives where we just have to simplify and meet our kids where they’re at? I love this so much! I love Emily Henderson’s style and think these are great tips. I just recently wrote a post similar to this as well on my blog about making family rooms family friendly. (thehouseoffigs.com) Two of my kids are in school but I still want the family room to be a place for them when they’re home- a place to house their toys/books, etc. I want to be intentional about our family time together and make it a place we can all enjoy. These rooms are bright and inviting for kids! Great advice from Emily. Her tips are really solid. We have used many of Emily’s tips, especially about removing precious things and having washable surfaces and fabrics. There are still plenty of chances to teach your children respect for other people’s belongings without having to put your best china in their reach. I don’t think going kid-friendly is going too far. You can leave your house adult-styled if your kids will cooperate, but as everyone says, it depends on the child. My eldest is very gentle and respectful of rules. He learned “no” at an early age. My middle child is nicknamed The Destructicon. She is mentally disabled and it is extremely difficult to teach rules and boundaries to a child who is physically 5 but mentally 1. She does not mean to be naughty but everything gets touched, usually broken, and she is a messy eater so often has a trail of food and grime falling off herself and her clothes as she moves about the house. There’s only so many times a day you can catch her, change her clothes, and wipe her hands. Imagine if your baby was able to walk, run, open doors and undo cupboards, remove kiddy-locks, climb up to top shelves….. your house would be trashed like ours is. I loved this “or empty until your children learn their manners and proper vintage etiquette skills like their mother”…so true.